Bracknell, UK. 7th February 2017 A new Panasonic whitepaper published today addresses the business tablet docking divide. European research from leading technology analyst group IDC reports that just 19% of business tablets are vehicle-mounted and only 23% of companies have even considered vehicle-mounting their tablets. 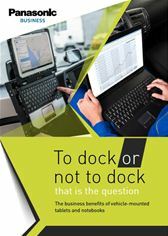 The Panasonic whitepaper “To Dock or Not to Dock; that is the question?” examines the business benefits of vehicle-mounted tablets following interviews with users in Europe and North America. According to the IDC research, there are a number of issues holding back businesses: security concerns (52%), worries about complex installations (44%), as well as legislation (40%) and certification (38%) considerations. Yet the main drivers for those organisations that have considered vehicle-mounting their devices are existing in-vehicle connectivity issues (54%), limited charging facilities (50%) and the fact that multiple devices are required by the mobile worker to perform their job (49%). Following interviews with IT decision makers from the logistics and utilities industries, and emergency services and roadside assistance organisations, Panasonic has distilled their key considerations for successfully implementing a vehicle docking solution. The whitepaper covers issues such as: customisation and design, safety and certification, connectivity, access to applications in the field, security, service and support. “Having spoken to customers across continents using Panasonic docking solutions, the benefits to the users and to the business of vehicle mounted devices are clear. I hope companies will find this paper informative and enlightening and will be able to finally put to bed the question of To Dock or Not to Dock,” said Blowers.